Today is the 73rd birthday of the legendary Russian cosmonaut Alexei Leonov. Leonov is a space explorer who deserves to be better known. He was the first man to "walk" in space, during the Voskhod 2 mission in 1965. The Voskhod capsule was equipped with a collapsible airlock to allow Leonov to leave and return without depressurizing the entire vehicle. Unfortunately, the designers of the airlock failed to take into account how much Leonov's space suit would expand in the vacuum of space. When the time came to return, he found he couldn't get back into the airlock. So he did the only reasonable thing: he popped open his space helmet for a second to let his suit deflate, then climbed into the airlock. That's the sort of cool-headedness which Tom Wolfe was talking about when he coined the term "The Right Stuff." That wasn't the end of Leonov's adventures on that flight. On re-entry the capsule failed to separate properly, causing uncontrolled tumbling, and the vehicle landed far from its target zone in wolf-infested woods. Amazingly, the secretiveness of the old Soviet space program meant that the incredible courage and level-headedness of Leonov and his copilot were not revealed to the world for a quarter of a century, until the Glasnost era and the collapse of the Soviet Union. Leonov was picked to be the first Russian on the Moon, as part of their abortive lunar program. He would have ridden a modified Soyuz capsule to Lunar orbit, then spacewalked into a one-man landing vehicle for a solo visit to the surface of the Moon. The repeated failures of the giant N-1 rocket led to that program being abandoned. Again, Soviet propaganda meant that the existence of the program was denied for decades. He did get into space again, however. Leonov was the Soviet commander of the Apollo-Soyuz joint space mission, which marked the end of the US-Soviet space race. He still remains active in training new cosmonauts, and is an accomplished space artist. Arthur C. Clarke did give General Leonov a nice tip of the hat in his novel 2010 -- the Russian spacecraft bound for Jupiter in that book (and in the film) is named for Leonov. What's a little depressing is that 2010 is only three years away and there aren't any manned spacecraft bound for anyplace more distant than low Earth orbit. Anyway, a big happy 73rd to Cosmonaut Alexei Leonov! It’s just the start of the summer, but my kids are already bringing me the insects they find in the yard and demanding to know what they are. Some things are easy – fireflies, ladybugs, or stinkbugs, for example – but if they show up with a larva, or so-help-me a leaf with an egg on it, I’m usually at a loss. And most of the guidebooks in our house are no help, either. They’re great for identifying adult stages, but they usually don’t include egg or larval forms. 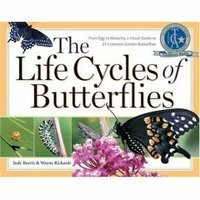 This is the problem that The Life Cycles of Butterflies by Judy Burris and Wayne Richards (2006, Storey Publishing) solves, at least for a few of the butterfly species you’re most likely to find in your yard. Last week, Steve Williams was gracious enough to take time out of his busy schedule and help us out with the pronunciation guide for Parasites Unleashed. This involved reading parasite species names into a microphone, which he did with grace and good humor, even though some of the names are real tongue-twisters. He was happy to find out that the game includes Wuchereria bancrofti -- one of his favorite parasites (and a subject of his own research). W. bancrofti is a filarial worm that lives in the tropics of Africa, Asia, and Central and South America. It’s the most common cause of lymphatic filariasis, a disease that affects about 100 million people worldwide. The worms themselves don’t look particularly exciting. Adult males are about 4 cm long and about 1 mm thick. Adult females are much larger – reaching 10 cm in length. A female is also 3 times as thick as a male, probably because her body is jam-packed-full of baby worms. The 80th Tangled Bank is up at Geek Counterpoint. Lots of good links, so read and enjoy. Today marks the 300th birthday of Carl Linnaeus, sometimes known as Carl von Linné, the man who devised the classification system still in use to organize all living things on Earth. He was a botanist himself, and did his share of macho field work. He led an expedition to Lappland to gather plant samples. He got a medical degree in Amsterdam and traveled to Oxford and Paris. It was in Amsterdam that he published his great work Systema Naturae, in which he laid out the principles of his classification system as applied to animals. He followed that up with Species Plantarum, doing the same for plants. So what's so important about Linnaeus's classification system, anyway? Wouldn't someone else have come up with it eventually? And isn't it just a set of arbitrary labels? 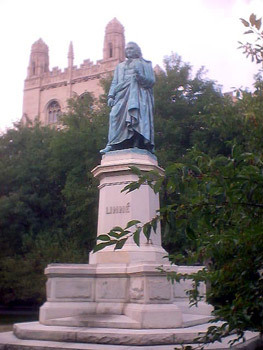 Linnaeus's system had the advantage of being logical, concise, and unambiguous. He also hit on what turned out to be a very significant set of criteria for grouping organisms. Instead of diet, or method of locomotion, he chose anatomical similarity. It's actually pretty subjective and common-sensical: creatures that look kind of similar belong together. But it happens to be the right system: by and large, creatures that look similar are related, and the degree of similarity maps pretty well to how closely they're related. In effect, Linnaeus was inventing what later came to be the discipline of cladistics. This also means that Linnaean classification isn't arbitrary. The species, genera, phyla, etc. actually map to real divisions among organisms. When paleontology and genetic mapping made it possible to start tracing the evolutionary heritage of groups of organisms, the Linnaean categories proved remarkably robust. Today the International Commission on Zoological Nomenclature still uses a much-tweaked but fundamentally unaltered version of Linnaean classification to organize the natural world. Linnaean classification also laid the framework for later thinkers about biology. Once you have all the species classified and grouped according to similarity, it's natural to start thinking about where this diversity came from. A century after Linnaeus built the chassis, Darwin installed the motor, and modern biology roared off in a cloud of dust. So today Linnaeus turns 300, and biologists all over the world are celebrating. This site has a round-up of events and resources. As he was a botanist, you can observe the date yourself by sending flowers to a member of your own species. As anyone who has taken freshman physics knows, physicists spend an awful lot of time thinking about things bumping into each other. In classical physics you study elastic collisions, often using a cool air-hockey table. In particle physics you study what happens when you bash energetic particles together. In astronomy you look at what happens when galaxies collide. Now Anthony Aguirre of UC Santa Cruz has taken things to the next level. What happens when universes collide? Short answer: bad things. Aguirre and his colleagues are interested in the expansion of bubble universes -- little baby universes spawned from energetic false vacuum fluctuations. This may be how our own universe came into existence. So what happens when two of these expanding bubbles come into contact? If you're near the point of contact, well, you're hit by a wall of energy moving at the speed of light. Game over. But it turns out not all universe collisions would be so devastating. Alex Vilenkin of Tufts University did the math, and it turns out there could be the cosmological equivalent of fender-benders, in which the bubbles interpenetrate without causing too much damage. This is good for bubble universe theorists. If interpenetrating universes would simply destroy each other, that of course leads to the question of why we haven't been obliterated by just such an event. But if low-impact collisions are more common, then it's possible our universe has already survived some. It's certainly suggestive that large-scale maps of our own universe seem to show huge voids -- kind of like great big bubbles. Does this have any relevance to us here on Earth? Not really. We're talking about events too huge for us to control or survive, which happen without warning and too fast to predict. But it's still cool. Last night, Jim Cambias and I were at a party for Small Beer Press’s most excellent 2007 releases, and the conversation turned to our own summer release – Parasites Unleashed. The subject inspired John Crowley to tell us a parasite story (with frequent interjections from his wife Laurie that he was getting it all wrong) about a surgeon he knew who was working in Afghanistan. The surgeon had put the patient under a general anesthetic, set an oxygen mask on his face, and left the room when he heard the nurses start screaming. A huge honking roundworm had come crawling out of the guy’s nose. Everyone was impressed, but they shouldn’t have been. A. lumbricoides is probably the most common parasitic worm found in humans. There are more than a billion infected people on the planet. That’s 1 in 6. Some estimates put the infection rates as high as a quarter of all humans. Brian Andres wrote a long review of Bone Wars: The Game of Ruthless Paleontology for the new issue of Palaeontologia Electronica. Have a look! Bishop William Wilberforce has lately been much in the public eye -- a remarkable thing, given that he's been dead since 1833. He's the hero of a recent film, Amazing Grace, based on a biography by Eric Metaxas. Wilberforce was, more or less, the man who ended slavery. He turned the abolition of slavery from a crank notion to the official policy of the British Empire -- which in turn got the ball rolling in other nations, including the United States and Brazil. Wilberforce didn't do it alone, of course. Among his allies in the fight against slavery were the industrialist Josiah Wedgewood and the physician and scientist Erasmus Darwin. Those two gentlemen were great friends, so much so that their children married, making them the two grandfathers of Charles Darwin. You may have heard of him. William Wilberforce had kids of his own, and his third son, Samuel, followed in his footsteps and eventually became a Bishop in the Church of England. And in 1860, at a meeting of the British Association at Oxford, Bishop Samuel Wilberforce entered into a now-legendary war of words with Thomas Huxley over the theory of Evolution by Natural Selection put forth by Charles Darwin. The details of the battle are actually somewhat fuzzy. The usual version is that Huxley blew away Wilberforce with a 40-megaton comeback after Wilberforce soapily asked him if he was descended from an ape. It seems that Huxley and his supporters may have remembered the incident with advantages some years later, but the event has gone down in scientific folklore as a triumph of science over religion. But it's more complicated than that. Samuel Wilberforce wasn't some know-nothing opponent of science -- he was a Fellow of the Royal Society and a fairly good amateur ornithologist himself. I suspect he did understand Darwinian evolution pretty well, and grasped the serious implications of it. Evolution removes the need for a divine Creator -- and all the evidence from paleontology, geology, and cosmology backs it up. With no God, there is no framework for a moral system. And without that, all we're left with is pragmatism: what works rather than what's right. Samuel may have been haunted by the thought that his father pushed for the abolition of slavery based entirely on morality -- specifically Christian morality. William's opponents all had arguments of pragmatism on their side. Slavery is evil, but it works. One of the big motivations behind Creationist opposition to the teaching of evolution is that it undermines religion. Supporters of teaching scientific truth tend to either brush that aside as absurd, or embrace it and dismiss the whole edifice of religion as so much superstitious rubbish. But without that rubbish, would William Wilberforce have been able to bring about the end of slavery? Despite its title, Curious Footprints: Professor Hitchcock’s Dinosaur Tracks & Other Natural History Treasures at Amherst College is not a traditional exhibit-by-exhibit guidebook for Amherst College’s Museum of Natural History. Instead, it’s a companion book that gives the reader a tiny taste of the museum’s long history and its behind-the-scenes contents.